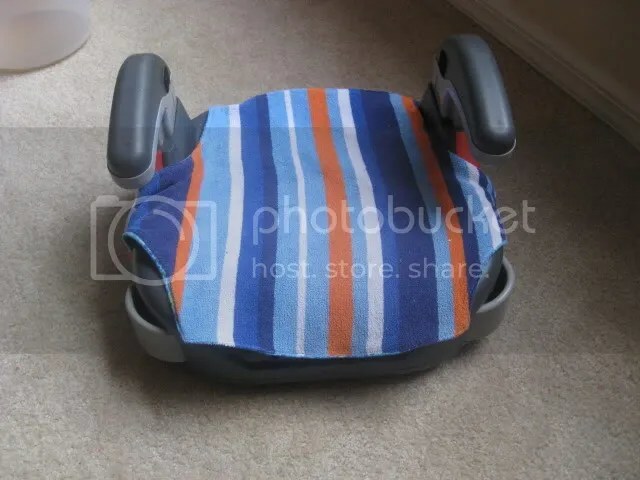 I have never been noted as the most observant mother but I did recently notice that Megan’s booster seat had seen better days. 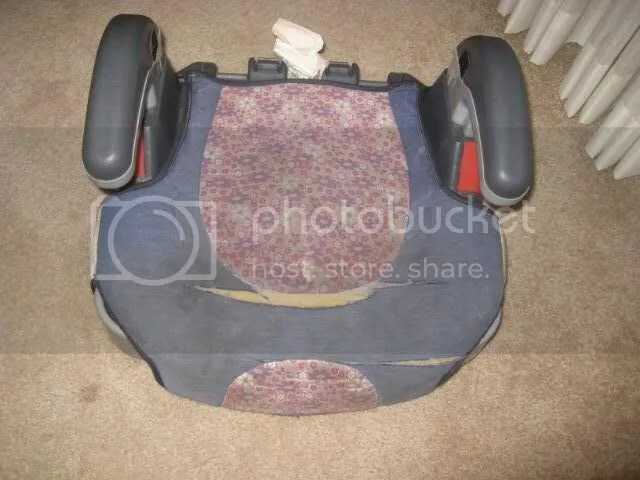 Florida law recommends all children under 80 pounds and 4’9″ tall be in at least a booster seat. So Megan will probably be in this seat for a little while anyway. 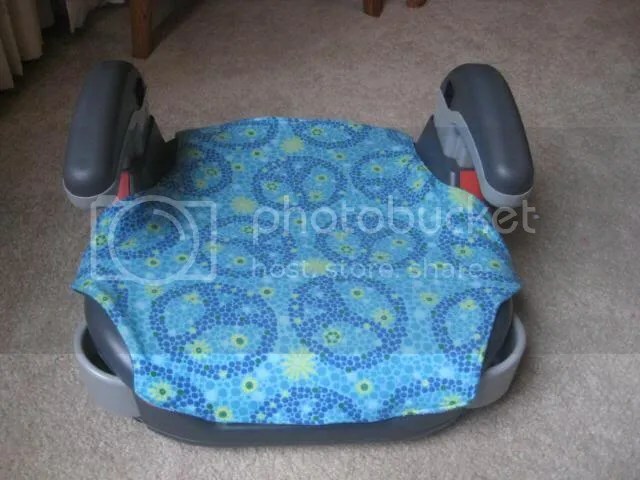 I let her pick out some fabric and we experimented until I figured out how to duplicate the seat cover. Basically I cut up the old one and traced it to make a pattern. 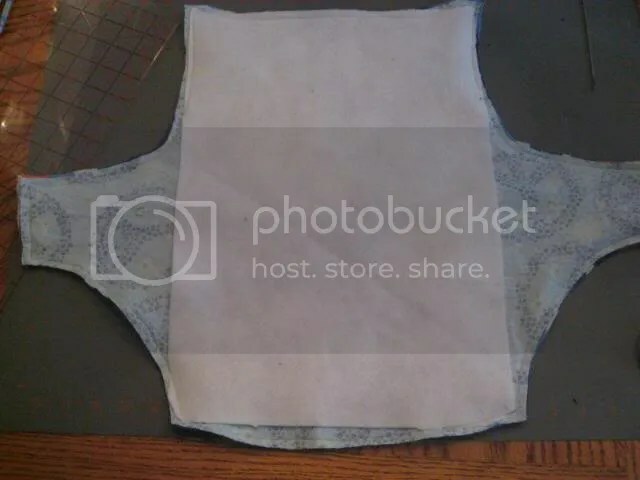 I did take some measurements so if you have a Graco backless booster you can use them to make one for yourself! 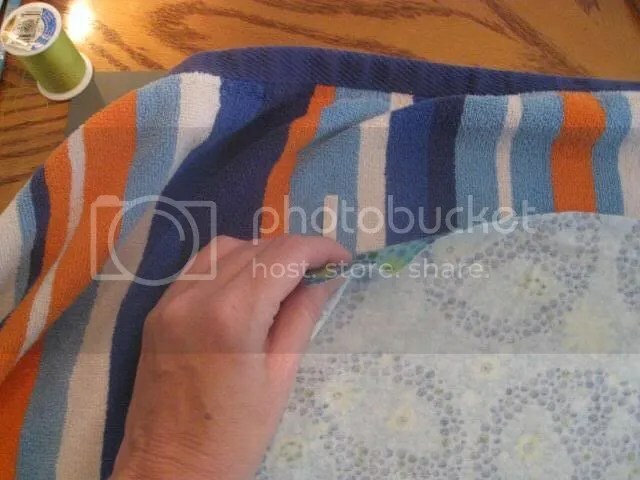 For this project you will need: about a half yard of cover fabric (I used flannel), a half yard of lining fabric (I used an old towel), fleece for padding and 1/4 inch elastic. I used scraps from old projects and it worked out great. I actually made four of these with my fooling around so I hope I have some tips that will save you time and frustration! The pattern is NOT 100%. You need to draw your own rectangles using those measurements. I had to reduce it to fit on one page so if you use them as-is you will get a teeny tiny booster seat cover! 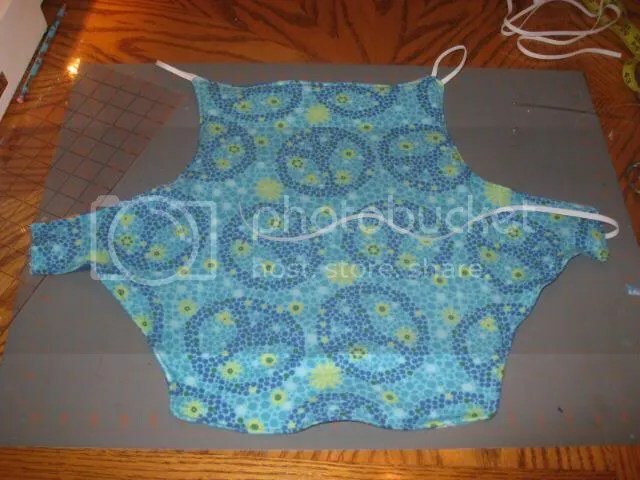 Cut out the top fabric. To save some time and aggravation, lay the top fabric on top of the lining fabric, right sides together and pin. That way when you cut out the lining fabric they are all pinned together and ready to go. For the lining I decided to use an old ripped beach towel so I could turn it over when we were coming home from the beach. The cover is reversible so use whatever lining you would like! I added the elastic at this point. You need two pieces 5 1/2″ long for the top and one 18″ long for the middle. Pin the short loops sandwiched in between the cover and lining fabric at each top corner. Pin the long elastic at the middle of the side piece (the short rectangle). 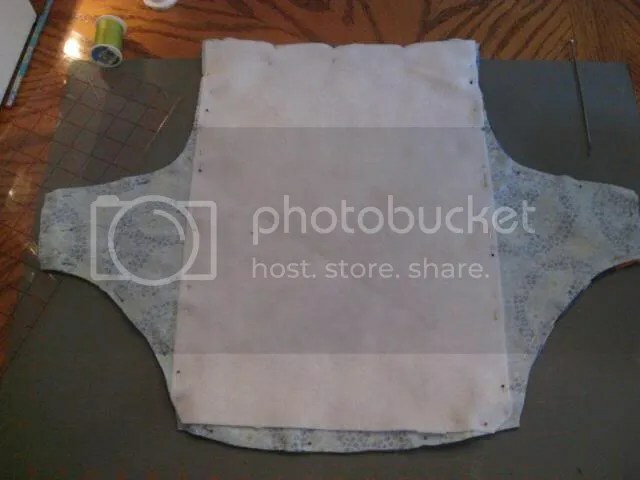 Cut out the lining fabric when you done pinning all the way around. You can baste the elastic into place if you would like. 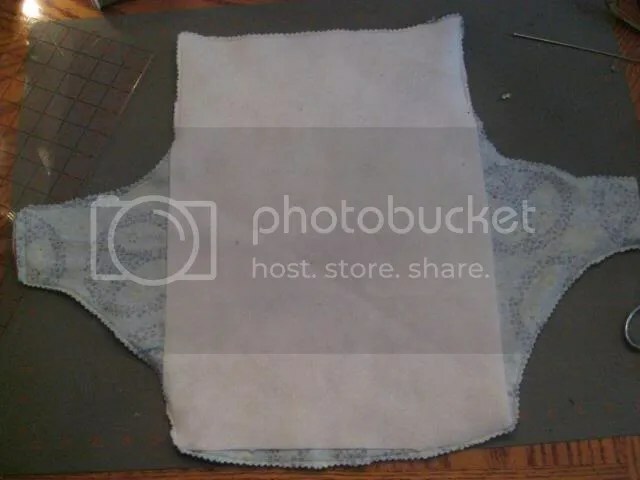 Cut a rectangle of fleece 11″ by 16 1/2″. Pin this to the middle of the cover on the top. Sew! Sew 1/4″ around the cover. 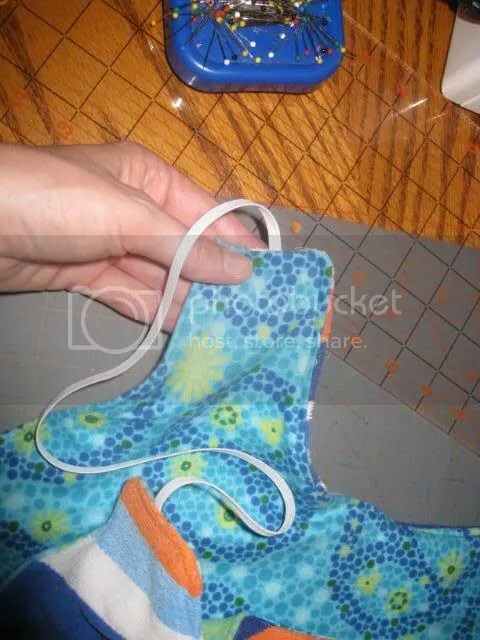 Start at the side piece that does not have the elastic pinned to it. Leave the side piece open to turn it rightside-out. Sew all around, going over the elastic twice (forward, backstitch and then on again). Clip your corners and curves. I used pinking shears and just trimmed all the way around. Turn it rightside-out and press. Be very careful, it will be difficult to pull it through the small home, so don’t rip it! Push out all the corners with a stick or your fingers and press it flat. Topstitch all the way around, except for the open side. That way if you ripped any of the side stitching on the small rectangle you can get it closed again. The towel unravels quickly if you don’t watch it! Cut the corners on the open side and tuck in the raw edges. Bring the long piece of elastic around from the other side and tuck in. Stitch the side closed, going over the elastic three times (forward, backstitch and then on again). 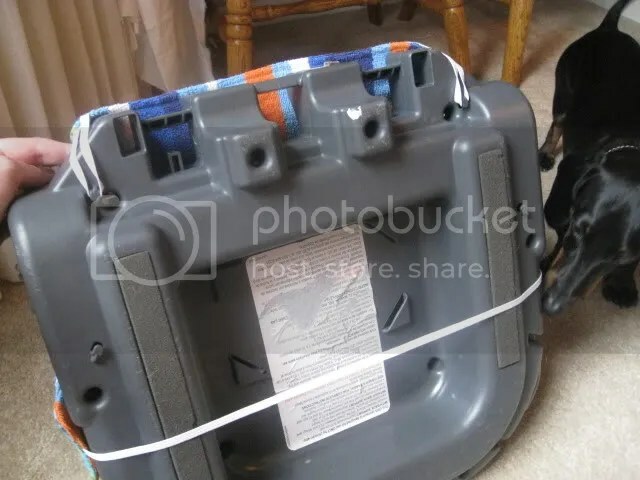 To attach, run the elastic on the hooks on the bottom of the booster seat and loop the long piece around the bottom. 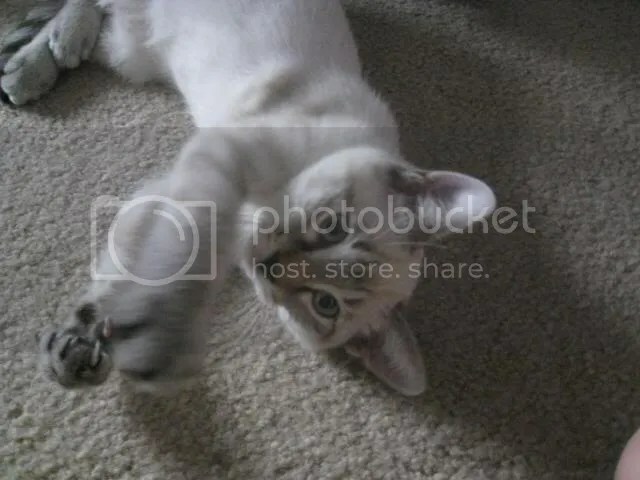 Look: it’s my helper! It is reversible, so we can turn it over when we are coming home from the beach. That’s it! Now I have a little booster seat cover that is reversible, cute and easily washable. Hope you make one too! ps Some of you might remember the four legged helper who is interested in all sewing projects. Well, Megan got another four legged helper for her birthday who is ten times worse: this one can jump on the table! She has dragged serger thread all throughout the house and knocked pins, patterns and rulers clear off the table! Don’t let this cute face fool you: she is devious!